There are tons of sites out there selling gardening tools, and it can be a challenge to know what's really good without buying it and trying it. I can tell you which have stood the test of time for me - which gardening tools I have found to be truly indispensable. Everything I recommend on this website comes from personal experience. The tools I recommend here are tried-and-true. For a tool to become a beloved tool, it needs to do its job really well, be comfortable in the hands, and be very durable. Tito says "It has to make you want to hold it." Save yourself some wasted money, and read through the article. I do all my vegetable gardening work with the following seven gardening tools, and most of it with the first two. None of them are cheap, but no kidding - if you invest in these up front - you'll never have to buy another gardening tool as long as you live (unless you want to of course). Forged digging fork This is my #1 Most Favorite Tool. First a few words about "forged": there is a crucial difference between a hand-forged, integral-socket digging fork, and the stamped steel variety found in virtual all hardware stores and Home Depot-type places. Hardware store variety forks just DO NOT hold up. When I first met Tito, he was using a new Ace fork, which he broke the handle on. He bought another just like it, and this time the whole forkhead fell out of the handle, because the little tang was just wedged into the wood. A forged-steel garden fork or spade is made by hammering red-hot steel into the desired shape. The process lines up the steel grains in a way that makes the steel WAY stronger than cold-stamped steel, both in terms of resistance to bending, and the strength of its attachment to the handle. The fork head and socket are one integral piece. I've been using mine for about 30 years (how time flies...). For a fascinating video of how these spades and forks have been made since 1780, visit the Clarington Forge website link on the right (the video is on their homepage). The digging fork is necessary for proper soil preparation. Most folks don't realize that rototillers are actually really bad for the soil. Rototilling creates a hardpan just below the depth of the tiller, which makes plant roots turn sideways when they hit the hardpan rather than being able to grow straight down into the soil. 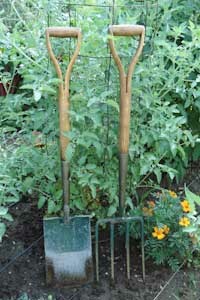 Forged square garden spade The standard, long-handled, round-nosed shovel used in construction for schlepping sand and cement doesn't work well in the garden. The difference needs to be experienced - it is difficult to describe. 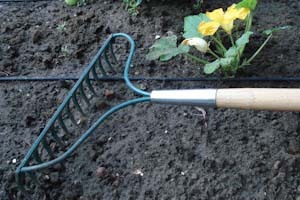 When "cutting an edge" on a bed or lawn, double or single digging in heavy soil - the D-handled, square-blade, forged garden spade is THE tool. They do not deflect when you stand on them, and stand on them you will when doing initial soil preparation. These shovels are rigid, so you can work them back and forth in the soil when loosening a shovelful. Used in conjunction with a spading fork. To see them in use, visit the French Intensive, Double-Dug Raised Bed article, where there is a You Tube video. Level rake This is not a leaf rake, but the stubby metal-toothed kind that looks a bit like a big comb on a handle. I use it after single or double digging to level the finished bed. I don't use this tool a lot, but it's the only tool that will do this specific job. Japanese gardening knife This little gem does everything else. Thow away every trowel you've ever owned. Throw away that little snaketongue-on-a-stick thing that you try to weed dandelions with. Throw away your bulb planter. Throw away your little three-tined weed thingy that never worked anyway. This one tool will NEVER bend or break (extremely hard steel), is just the right width, shape and sharpness to do all the jobs listed above, and more jobs that you haven't thought of yet. My friend Ralph calls it a "Speedy Rabbit" because of the tool manufacturer's logo, but I call it a Speedy Rabbit because it chews out deep-rooted weeds so easily. It's not sharp enough to cut anything, but it is sharp and rigid enough to penetrate even clay soils. The Japanese name for this tool is "hori hori", which means "diggy diggy". Kinda cute, huh? Japanese weeding sickle I have tried every hoe there is. The standard hoe. The pull hoe. The triangle hoe. The circle hoe. The scuffle hoe. Hoe hoe hoe... until a couple of Christmases ago. I got a little Japanese weeding sickle that you pull toward you about a quarter-inch below the surface of the soil, and it is so razor sharp that it cuts the weed roots right off, cleanly. By far and away the best weeding tool I've ever used. The Japanese do hardened steel like no one else. The darn thing is still sharp after two seasons of cutting roots and hitting bits of rock. Compost fork For decades I used my digging fork for turning the compost. Last year I responded to an online ad from Clarington Forge, and treated myself to a compost fork. Now I don't know how I ever lived without this tool! It is much lighter (don't use it for digging!) and has much sharper tines than the digging fork, which makes it SO much easier to turn the compost. It halves the time it takes, and uses less body energy. I love this tool! Watering Wand Our vegetable garden is on leaky-pipe irrigation, but I have a ton of flowers and vegetables in pots, hanging baskets, and upside-down planters that need watering by hand. I have a Dramm high volume, low pressure watering wand that I call my Magic Wand. It's the bees knees of watering tools, and the solid brass shutoff never leaks. It is the best for watering newly-planted seed flats, because the flow is so gentle it doesn't disturb the seeds. You don't need the fancy spin-head multi-choice spray pattern gizmos for gardening. In my experience the other kind always ends up leaking and drips down your arm and into your shoes. Loppers These come in two main varieties: bypass (which work like scissors) and anvil (which work like a knife against a cutting board). Some folks swear by one over the other. I like the anvil type, because it's too easy for the bypass ones to deflect and spread apart when being asked to cut an old dead lilac stalk. But some people say the same thing about the anvil kind. Personal preference, I guess. But either way, they're great for branches too big for the Felco hand pruners. Bow Saw And for even bigger branches I use a cheap landscaper's bowsaw from Home Depot. Not really under the category of vegetable gardening tools, but useful for the surrounding jungle. The circle hoe was the first gizmo that doused the flame of my tool lust. I'd read such great things about it: you can get right in close to the base of your vegetables without damaging their roots. That's true. You won't damage anybody else's roots either, except the ones in about a half-inch area right at the front of the hoe. Don't waste your money.